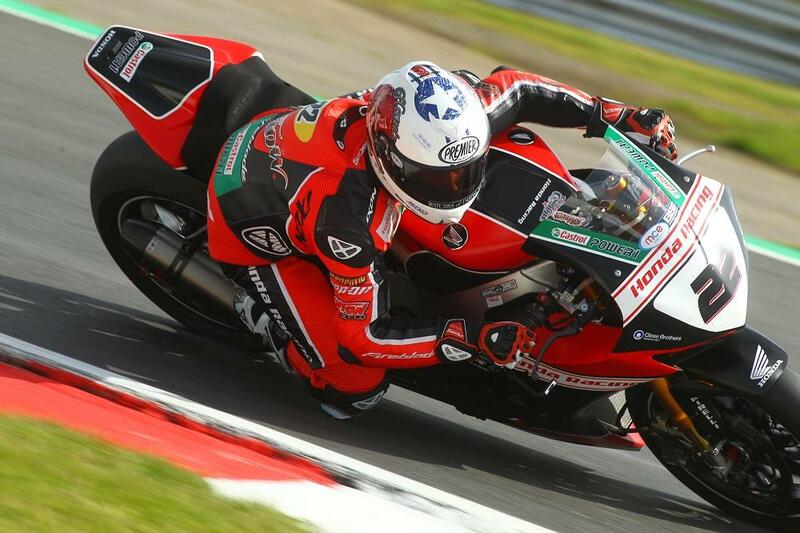 Jason O’Halloran took a jubilant debut MCE British Superbike victory in the first race at Snetterton ahead of Honda Racing team-mate Dan Linfoot after an incident-packed first lap saw pre-race favourite Shane Byrne on the grass. Byrne bolted off the line to take the lead into turn one but the first drama came at turn two with Richard Cooper clipping the back end of the bike in front and crashing out, taking James Ellison and Broc Parkes with him. Christian Iddon was hit up the rear and ran on into that prior incident, leaving him with a badly broken boot. Further ahead, Byrne was being hassled for the lead by Haslam, who pulled a hard move on the Ducati man at Palmer leaving him nowhere to go. Running on to the grass, Byrne re-joined the race second to last. This left Haslam in the lead but it wasn’t for long, with both Hondas charging past to control the race. Charging through the field, hammering out quick times Byrne made his way back up to third before drops of rain led him to back off in order to safely bring it home. Having destroyed his tyres, Haslam dropped back to fifth place with FS3 Racing’s Billy McConnell taking a momentous fourth. Michael Laverty’s bad luck wasn’t to end as he was caught up in an incident involving Glenn Irwin and Peter Hickman, who caught the back of Irwin’s Ducati as it cut out with quickshifter issues, leaving the Tyco BMW with nowhere to go as he hit the stricken Hickman. Having traded places across the final ten laps, it was O’Halloran who led with three laps to go but with rain on his visor, Linfoot made a move in case the red flags came out. The Aussie tried a pass on his team-mate into turn one on the final lap, but Linfoot took control until a huge slide at the final corner forced him to relinquish the lead. Jake Dixon took an impressive sixth place ahead of Luke Mossey and Tommy Bridewell with Stuart Easton and Lee Jackson rounding out the top ten.